I love brownies just as much as any other chocolate lover, but blondies hold a special place in my heart. I’ve made plain blondies, butterscotch, chocolate chip, peanut butter and cranberry orange varieties (both gluten free and non-GF over the years) but never have I had a request for a booze blondie…until last weekend. Chris and I were hanging out with his co-workers at a BBQ, and one person wanted a margarita brownie while enjoying her beer and dessert – the best of both worlds? Maybe so…I don’t drink alcohol but I will gladly cook with it! I was up for the challenge so I thought about making a regular cocoa brownie with a margarita cream cheese swirl – which I may get around to making in the future – but I kept coming up with different ideas based off her request. 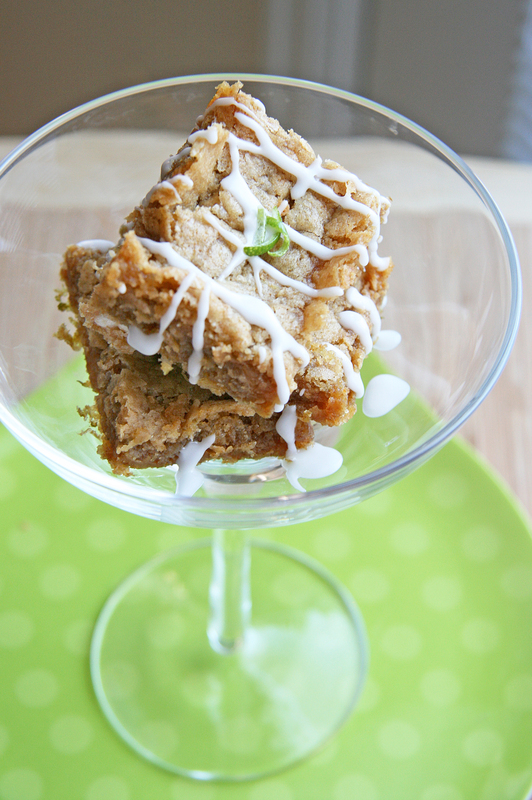 Then I had it, white chocolate margarita blondies! I still incorporated a type of chocolate liked she asked but I felt that a blondie base would help bring out the citrus flavors better than the cocoa version. The white chocolate chips are unfortunately not refined sugar free, but you could make your own raw white chocolate like Tiffany (if you are extra adventurous) or substitute carob chips if you prefer. I only used 1/3 cup of high-quality white chocolate for the bars, so I thought that one test square wouldn’t hurt me too much 🙂 These were ultimately going to Chris’s colleagues but of course I had to taste them! You could even go without the chocolate or substitute shredded coconut for a tropical flare. I typically like to make things from scratch but instead of experimenting too much with the base, I used Amy’s yummy Apricot and Carob Blondie Bar as starting point to tweak since I had some Pamela’s Baking Mix lying around. These bars are moist with a hint of lime and you get a hint of tequila and the margarita essence from the drizzle of icing. 1. Preheat oven to 35o F. Line a 8×8 pan with parchment paper or grease. 2. Sift together Pamela’s Baking & Pancake Mix, baking powder, baking soda, and salt. Whisk until evenly combined. 3. In a separate bowl, whisk palm sugar, shortening, applesauce, vanilla, zest, tequila and lime juice until smooth. 4. Mix dry ingredients into wet ingredients and fold until nearly incorporated. Add white chocolate chips and fold in until just combined (do not over mix). 5. Spoon batter into baking pan and spread evenly. Bake for 20 – 25 minutes until top is golden brown and blondies pull away from the sides of the pan (ovens vary). Let cool completely before cutting. 6. When blondies are almost cool, prepare your icing/drizzle. In a small bowl, add all icing ingredients and stir to combine. It should be the consistency of a glaze so you can drizzle the icing over the cooked blondies. The icing will firm up a bit once refrigerated. 7. 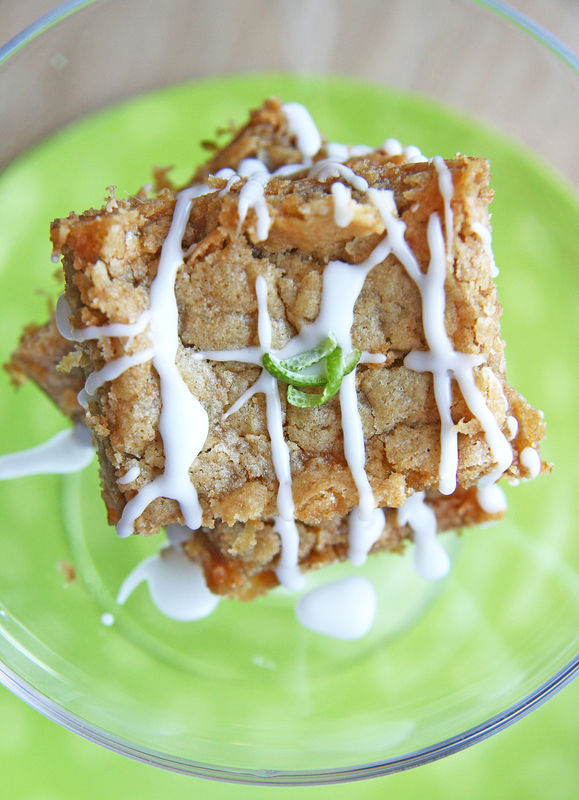 Drizzle over blondies and sprinkle lightly with sea salt and extra lime zest, if using. Refrigerate to set the icing (about 30 minutes) and enjoy! My friend’s husband brought these into work today and they were absolutely delicious!!! Thanks Miss Noshing!! Love, love, love this! What a fantastic flavour combination! Thank you!!! I might even up the tequila next time or add some triple sec instead of the lime juice in the icing since they had a little more lime taste than margarita. There’s always room for tweaking but I definitely enjoyed the flavor combo! Good suggestion on your guest’s part, and wonderful job of tweaking on your’s 🙂 These look awesome – I feel like the white chocolate and vanilla are probably a great base for the margarita flavor since they aren’t quite so rich as cocoa. I almost died when I saw this recipe!! Had to feature it in my Cinco de Mayo Margarita Round up!! Waaayyyy to good not to share! Pingback: It’s Blonde Brownie Day!